Dr. Krishna Kumar died April 23, 2014 at age 83. REGINA — Family members are remembering Krishna Kumar — a prominent Saskatchewan physician and neurosurgeon — as a caring family man and devoted to the treatment of his patients. On Sunday night, Kumar, 83, died in hospital after suffering cardiac arrest the day before. “When I went to the hospital (Sunday), the nurses in the (intensive care unit) were crying because he was so loved there,” said Kumar’s son Rajeev on Monday. Born in Jabalpur, India, Kumar came to Canada in 1957. He studied medicine in India and received neurosurgery training in Halifax, Edmonton and Saskatoon before settling in Regina in 1962. Known for his research in the treatment of chronic pain through spinal cord stimulation, Kumar was named Saskatchewan’s physician of the year in 2008. He is also a recipient of the Queen’s Diamond Jubilee Medal, the Saskatchewan Order of Merit and the Order of Canada. Kumar’s work was the subject of the documentary Living with Pain. His life and work was also documented in a 2010 biography — Reaching the Impossible — Dr. Krishna Kumar’s Story. Kumar Lane, located in the city’s Kensington Greens subdivision near Albert Street north, is named in his honour. Kumar loved travelling around the world, photography, gourmet food and fine wine. While vacationing, he especially enjoyed relaxing in hot tubs or hot springs, said Rajeev. Kumar was also a devoted fan of James Bond movies. “He liked action movies. If it was a slow drama, he didn’t like that,” he said. Rajeev notes his father had strong values and expectations of his family. Rather than telling his sons and daughter how to live by those expectations, he led by example. One expectation he had of his family was to be respectful, said Rajeev. “He always treated people with respect — no matter what — whether or not it was the person who was his patient, his colleague, the nurse or the cleaning person in the hospital,” he said. Ashok Kumar, Krishna’s oldest son, said that family and patient care were more important to him than awards and recognitions. After a heart attack last summer, Kumar continued his research but reduced his workload to only seeing a few patients. On Saturday, Kumar and his wife Shubha were at the cardiac rehabilitation facility when he suddenly suffered cardiac arrest. Rajeev said a positive is that his father died peacefully and didn’t suffer. “He suddenly fainted and that is it. He didn’t feel anything more. If anyone would want to die, that would be a beautiful way to die,” he said. Besides his wife and two sons, Krishna Kumar is survived by his daughter Usha Nath, six grandchildren and three great-grandchildren. Kumar’s funeral is scheduled for 2 p.m. today at Regina Funeral Home. From 1-2 p.m. a public viewing will be held. On Wednesday at 7 p.m., a Hindu memorial service and prayer will be held at the Regina Hindu Temple. Krishna Kumar was born in Indore, India on January 12, 1931. He did medical studies in India, including general surgery, then studied neurosurgery in Canada, becoming a Fellow of the Royal College of Surgeons of Canada (neurosurgery) in 1961. He was one of two neurosurgeons in Canada who first performed complex neurosurgical procedures for the treatment of Parkinson’s disease and CHRONIC PAIN, and he became an internationally-known expert and speaker in pain management. His neurosurgical procedures were televised on national networks. 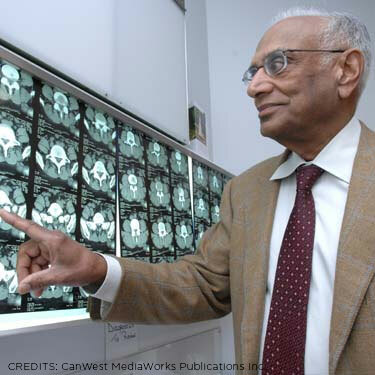 As a clinical professor at the UNIVERSITY OF SASKATCHEWAN, Dr. Kumar published scientific papers and encouraged students and residents to enter the field of neurosurgery. Dr. Kumar was responsible for bringing the first magnetic imaging resonance unit to the REGINA Health District and acquired a Stealth Navigational System for computer-directed surgery, the most sophisticated of its kind in Canada. He served as chair of the medical board of the WORKERS’ COMPENSATION Board of Saskatchewan for 20 years. He received a Quality Improvement Award from the SASKATCHEWAN MEDICAL ASSOCIATION and the Saskatchewan College of Physicians & Surgeons, a Community Appreciation Award in 1996, and an Excellence in Teaching Award in 1997. He received the Saskatchewan Order of Merit in 2000.